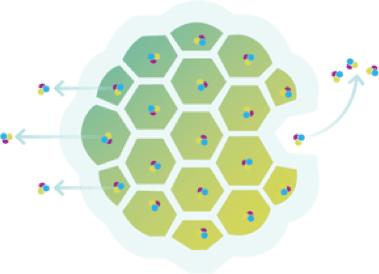 The DepoFoam carrier matrix consists of microscopic, spherical, lipid-based particles composed of a honeycomb of numerous, non-concentric, internal aqueous chambers containing the encapsulated drug. Each chamber is separated from adjacent chambers by lipid membranes. 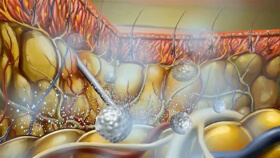 Following injection, the DepoFoam particles release the drug over an extended period of time due to erosion and/or reorganization of the lipid membranes. We are leveraging the proven safety, flexibility, and customizability of our DepoFoam technology for acute, sub-acute, and chronic pain applications. The current opioid crisis was triggered by a pain epidemic. Eliminating opioids will not address the significant unmet need for new tools and strategic approaches for managing pain. We have selected two DepoFoam-based programs for clinical development. The first is the intrathecal or subarachnoid delivery of a DepoFoam-based local anesthetic other than bupivacaine for acute and chronic pain. We believe this approach may provide an alternative to the use of intrathecal or subarachnoid opioids typically delivered by pumps and catheters. The second clinical compound we have selected is DepoDexmedetomidine. With this product, we see the target market as end-of-life pain and painful conditions in the elderly. We believe the extended delivery of a therapeutic dose of dexmedetomidine has the potential to offer patients mental acuity and quality of life while also providing adequate pain control. Lambert WJ, Los K. DepoFoam® multivesicular liposomes for the sustained release of macromolecules. In: Rathbone MJ, Hadgraft J, Roberts MS, Lane ME, eds. Modified-Release Drug Delivery Technology. 2nd ed. New York, NY: Informa Healthcare USA; 2008:207-214. Angst MS, Drover DR. Pharmacology of drugs formulated with DepoFoam: a sustained release drug delivery system for parenteral administration using multivesicular liposome technology. Clin Pharmacokinet. 2006;45(12):1153-1176. Kohn FR, Malkmus SA, Brownson EA, Rossi SS, Yaksh TL. Fate of the predominant phospholipid component of DepoFoam drug delivery matrix after intrathecal administration of sustained-release encapsulated cytarabine in rats. Drug Deliv. 1998;5(2):143-151. Richard BM, Newton P, Ott LR, et al. The safety of EXPAREL® (bupivacaine liposome injectable suspension) administered by peripheral nerve block in rabbits and dogs. J Drug Deliv. 2012;2012:962101.